The chief concerns of most bank executives still focus on legal and regulatory issues, according to most surveys. Community banks are particularly concerned with eliminating barriers that give unfair advantages to financial services competitors, such as credit unions. However, another concern pertains to technology: keeping nonblank competitors out of the payment system. identification of customer’s financial needs and wants and forecasting and researching future financial market needs and competitors’ activities. appropriate products to meet consumers’ financial needs. promotional activities and distribution system in accordance with the guidelines and rules of the Reserve Bank of India and at the same time looking for opportunities to satisfy the customers better. 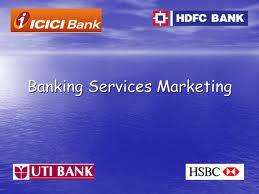 marketing culture – among all the customer-consciousness ‘Personnel’ of the bank through training.